ALLEN PARK — The Detroit Lions have desperately tried to improve what has been a weakness, signing and drafting players to improve their running game. Detroit ranked last in the NFL last season in rushing offense and has been among the league’s worst on the ground offensively in recent seasons. Lions general manager Bob Quinn has made it a priority to fix the problem. He signed veteran LeGarrette Blount in free agency and moved up in the draft to select Kerryon Johnson in the second round. 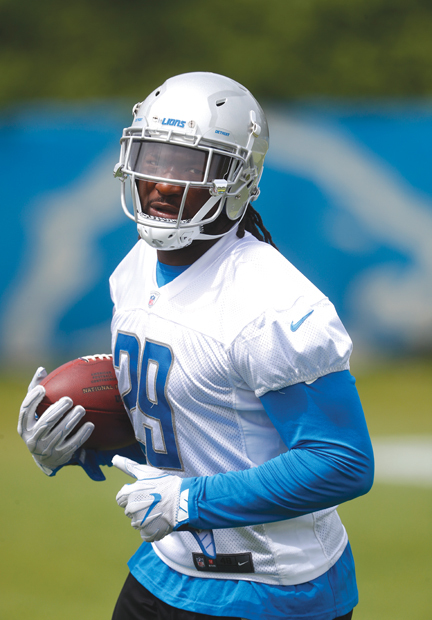 The newcomers will compete with or perhaps push out Ameer Abdullah in what has become a crowded backfield with running backs Theo Riddick, Zach Zenner and Dwayne Washington also on the roster. “We got a lot of talent,” Johnson said Tuesday after a minicamp practice. “A lot of these guys are good. I’m stepping into a lot of competition. A lot of these guys have played in the past. A lot of these guys want to keep playing in the future. Detroit selected Frank Ragnow 20th overall in the draft, counting on him to play alongside four returning starters to bolster the offensive line. The former Arkansas center looks as if he’s getting a shot to play left guard with the first-string offense. Anyone watching the Lions, especially under former coach Jim Caldwell, noticed they simply couldn’t run the ball well consistently. That played a part in Caldwell getting fired and Matthew Stafford directing a one-dimensional offense that led to him being sacked 47 times last season. The first change Quinn made to address the issue in the offseason was adding the 31-year-old Blount in the opening days of free agency. He helped Philadelphia and New England win the past two Super Bowls.